In 1923 A.E.Gray launched the Gloria Lustre Range which was developed in collaboration with Gordon Forsyth. Susie's progress was rapid, alongside the increase in production of bright hand painted ranges Gray's launched a new factory mark showing a steamship at full speed, and incorporated the words 'Designed by Susie Cooper.' This trend in designer marks was to become fashionable throughout the potteries during the 1930's. With an increased desire to design shapes as well as patterns Susie left Gray's to establish the 'Susie Cooper pottery' in October 1929. With the help of her family and particularly her brother in law, Susie took two rooms in a building known as the George Street Pottery, Tunstall. With the help of six paintresses a paint shop and office were established and then the decoration of pots began. After three weeks the George Street Pottery was closed by the owners creditors, so Susie was forced to relocate. It was March 1930 before They managed to find suitable premises. This time the chosen site was the Chelsea Works a small pottery in Moorland Road, Burslem. Keen to resume production, Susie initially bought in white ware for decorating from various manufacturers, blacking out their factory marks and adding her own. 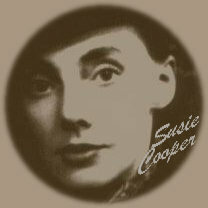 (Susie Cooper Productions enclosed in a triangle and rubber-stamped in black.) Demand for Susie Cooper ware grew steadily and despite taking on extra staff, it became necessary to find larger premises. Wood & Sons of Burslem could provide Susie with the best quality white-ware that she required and at a reasonable price. With this in mind, it was decided that it would be advantageous to move Susie Cooper Productions to premises adjacent to Wood's factory. This move into her famous 'Crown Works' took place in August 1931. The bulk of her production during these early years reflected the tastes of the times, bright floral's, geometric and modernist designs in bold hand painted colours. The first shapes designed by Susie as an independent appeared in 1930 with the assistance of Wood & Sons and around the same time the triangle mark was replaced by the Leaping Deer version which has become the most commonly associated mark with her work. The re-opening of the factory brought new challenges. The fire had severely damaged her stock of lithographs and the rationing of building materials made refurbishment difficult. Similar restrictions on supplies of materials also meant that producing new lithographs to use was also limited, so Susie returned to pre-war decorating techniques to increase production. Hand painting, mainly under glaze, aerographed and sgraffito decoration all re-appeared, however the colours were more subdued than pre-war equivalents, and organic or plant forms provided the inspiration for her work. In June 1950 it was announced that Susie Cooper had acquired a bone china manufacturer. Until now Susie's' production had been restricted to earthenware. She soon set about designing new shapes for this manufacturing process. The resulting "Quail shape is possibly the most elegant shape Susie designed. This fresh and curvaceous shape was embellished with subtle sgraffito scrolls, circles and dots on an aerographed body. The most flamboyant of her designs to be produced in this style are the "Lion and Unicorn" patterns issued for the Royal Pavilion at the 1951 Festival of Britain. A second fire at Crown Works in March 1957 brought about another loss of production which took a year to recover from. Little in the way of new patterns appeared during this time. By the mid 1960's the Plant family had concerns about their personal financial position and when in 1966 Wedgwood made a take over bid, the offer proved too good to ignore. Plants' sold their share in the partnership and the company, along with Susie Cooper, became part of the Wedgwood Group. At first Wedgwood continued production of Susie's designs, in particular "Black Fruits" and "Glen Mist." They also continued production of the "Can" shape which Susie designed in 1958. The initial reaction to the merger was one of optimism: the merger released Susie from factory management responsibilities, allowing more time for designing. Wedgwood were also pleased with their acquisition adding the words "Susie Cooper Design" to the famous Portland vase factory mark when appropriate. Recession in 1979 brought about the closure, by Wedgwood, of her beloved Crown Works. Susie moved her design studio to Adams & Sons (also part of the Wedgwood Group) and continued to work from there, until her move to the Isle of Man in 1986. From here she continued to work as a free-lance designer.